Wondering how much college will cost is probably the biggest concern many high school seniors (and their parents!) have right now, with the fall quickly approaching. Our Student Finance office is currently in the process of sending out financial aid estimates to students already accepted to PUC to help them determine how much they can expect to pay next year. 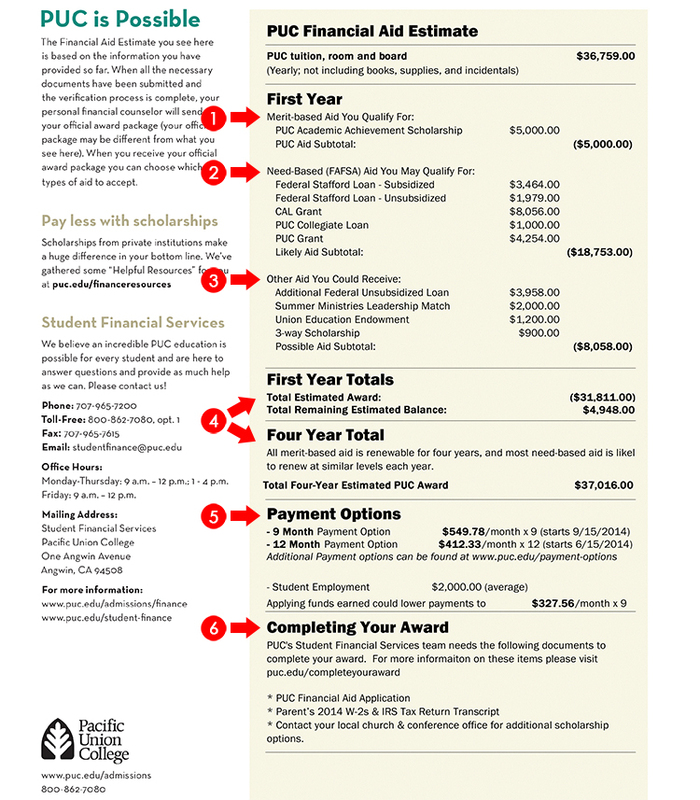 If you haven’t received your estimate yet, or if you haven’t finished your application to PUC, this post will help you understand what you need to submit to ensure you get an accurate financial aid estimate. We’ll also break down a sample estimate to help make the process clearer to those of you who have received one but may be confused over how to read it. Any PUC scholarships you are eligible for or have applied for and received will be listed here. For this estimate, they are receiving $5,000 for our Academic Achievement Scholarship, meaning they have a GPA between 3.25-3.49. Listed here will be potential aid based upon the information you provided on your FAFSA; including any grants or loans you’re eligible for, such as Cal Grant. 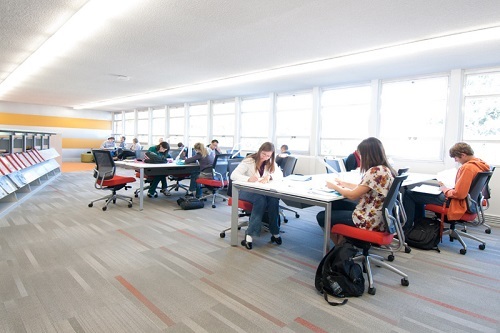 PUC also offers grants and loans to students on a case-by-case basis. When you receive your official award package, you can choose what aid you accept, so don’t be worried if there are more loans listed on your estimate than what you want to take out. If you may potentially qualify for any other aid, it will be listed here, such as additional federal loans. You may also want to consider looking into scholarships such as the Union Education Endowment and 3-Way Scholarship which are offered through your local conference or church. For more information, contact your local conference office. This is definitely a little confusing! For our sample estimate, this student is estimated to receive about $31,811.00 in aid their first year, which leaves the remaining balance at $4,948.00. The four year total, however, is estimated at $37,016.00, as it is only aid given by PUC, which is the Academic Achievement Scholarship and the PUC grant times four. All merit-based aid is renewable for four years, and most need-based aid is likely to renew at similar levels each year. You have a few different options for how you would like to make your payments for your school bill. You can choose the nine month option, which has you pay only during the school year, or you can pay every month throughout the year, including the summer months. You can also choose to work to help lower your monthly payments, and on average a student earns about $2,000 towards their bill by working around 20 hours per week. 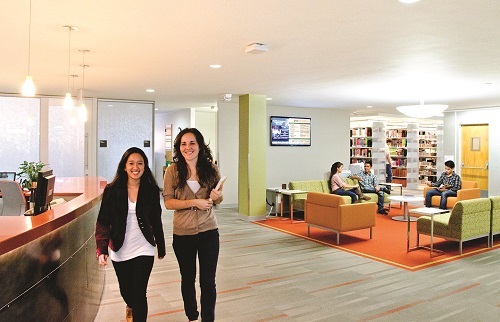 Learn more about working on-campus by reading our “Working On-Campus Has Its Perks” post. Obviously, our Student Finance office needs certain information from you in order to calculate how much financial aid (including grants, loans, and scholarships) you’re eligible for. If we’re missing any required documents for you, it will be noted here. There are several other things you can do to help lower your school bill. Contact your local church and conference office to see whether they have any scholarship opportunities for college-bound students. I also recommend taking a look at a list of scholarship websites we’ve compiled on our website, which you can find at http://www.puc.edu/financeresources (click the “Helpful Resources” tab on the left). There’s plenty of money out there to help cover the cost of college, you just have to look for it! Don’t hesitate to contact our Student Finance office after you receive your estimate if you have questions about what you’re eligible for or what documents you need to submit. They can be reached at studentfinance@puc.edu or 800.862.7080 option 1. We Want You at PUC This Spring! If you missed the deadline to come to PUC for this past winter quarter, don’t worry! 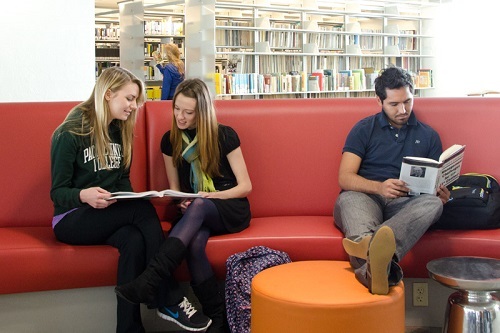 You still have a chance to transfer for the spring, which starts on Monday, March 30th. There’s plenty of time for you to get things together to be at PUC. Below is information I hope is helpful for anyone looking to transfer this coming quarter or sometime in the near future. 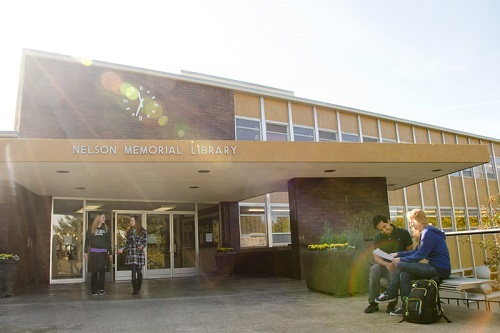 You can learn about PUC’s admissions requirements for transfer students and what we consider to be a completed transfer student application here. Our office gets a lot of questions from students asking us how soon they can expect to hear back from us about a decision. It’s completely up to you how quickly you get your documents to us! As soon as the Admissions Office has all the documents needed for your application, your file will be reviewed for acceptance. If you’re accepted, you will receive an email that day notifying you of the decision, with more information following in the mail. After you’ve been accepted, you will need to pay a $150 enrollment fee in order to register for classes. Once this fee is paid, your transcripts will be taken to our Records office for a degree evaluation which will show what credits transfer, and if anything doesn’t. When your program evaluation is completed, it will be available on your WebAdvisor account, along with contact information for your advisor. Take some time to look at how it applies to your degree requirements, and if you have any questions, don’t hesitate to ask your advisor. You can read our “We’re Here to Help!” blog post to learn more about how your advisor is key to your success at PUC. The last step is easy – you just need to get here! The day before each quarter begins, there’s a short orientation for new transfer students to help you get to know other new students and to go over information you’ll find helpful as a student at PUC. If you have questions about transferring to PUC, contact Enrollment Counselor Igdaly Patel. She can be reached at igdaly@puc.edu or at 707.965.6422. Did you know PUC is one of only two liberal arts colleges in California to offer a degree in aviation? That’s right! The airport in Angwin is even located on campus, and we also have a Frasca 180, a flight simulator that allows students to train for inclement weather and other hazards without ever leaving the ground. Pretty cool. 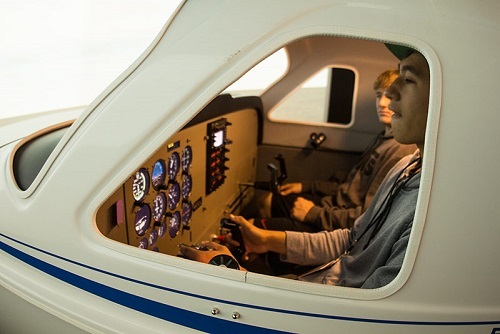 Students who major in Aviation at PUC can earn multiple certifications, and our Private Pilot and Instrument courses are approved by the Federal Aviation Administration (FAA) as a 141 Pilot School. PUC offers both an AS and a BS in Aviation, and graduates can work doing a variety of occupations within the field. You can learn more about PUC’s Aviation programs by reading through the Aviation Department’s page on our website. PUC students “fly” the Frasca 180 flight simulator. If you haven’t yet figured out yet what you want to study in college, here are five reasons why you may want to consider majoring in Aviation! In 2012, the Bureau of Labor Statistics (BOL) estimated there were about 104,000 pilot jobs in the United States. Aviation graduates can work within the field doing a variety of occupations; from commercial or airline pilot to working piloting cargo, sightseeing tours, sky divers, assisting with aerial photography, assisting with rescue services, and more. The BOL estimates airline pilots fly approximately 75 hours per month on a varying schedule, in addition to performing other duties about 150 hours per month while commercial pilots usually fly between 30 to 90 hours per month and may also have an irregular schedule. It’s important to keep in mind some pilots may also spend a significant amount of time away from home, depending whether their flight assignments have overnight layovers. One nice perk though – if you work for an airline, typically your hotel, meals, and other travel expenses are taken care of by the company. Nice! 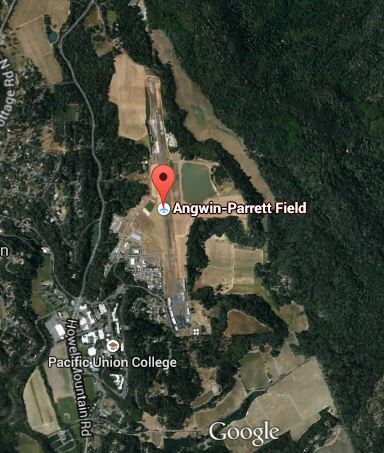 An aerial view of Angwin-Parrett Field, via Google Earth. Note PUC’s main campus to the bottom left! According to the BOL, the median annual wages for airline pilots was around $114,000 in 2012, while the median annual wage for commercial pilots was about $73,000. It’s important to note those are median numbers however, meaning there are pilots who make a lot more, and a lot less. The Air Line Pilots Association estimates most airline pilots start at about $20,000 per year. While airline pilot jobs are expected to decline about seven percent between 2012 and 2022, commercial pilot employment is projected to grow about nine percent. However, the BOL is quick to note that there is potential for job opportunities when pilots retire, as they are required to retire when they turn 65. If you have a taste for adventure and enjoy new experiences, a degree in aviation may be for you. Obviously, a major perk of working as a pilot is the potential to travel, depending on the occupation you have within the field. Whether you work as an airline pilot and regularly jet to exotic locations like Paris or Tokyo, or work regionally as an air ambulance pilot, there are always new sights to be seen. The sky is literally the limit!